6. Department of the ICU, Sun Yat-sen University Cancer Centre, Guangzhou, 510000, PR China. Gastric cancer has high incidence and fatality rates, making chemoprevention agents necessary. There is an ongoing debate about aspirin/nonsteroidal anti-inflammatory drugs (NSAIDs) use can significant reduce the risk of GC. We conducted a meta-analysis of existing studies evaluating the association of anti-inflammatory drug and GC. We performed a systematic literature search of PubMed, Web of Science, Embase, OVID, Cochrane Library and Clincialtrials.gov up to August 31, 2015. Either a fixed-effects or a random-effects model using was based on the result of homogeneity analysis. Subgroup, sensitivity, meta-regression, and publication bias analyses were evaluated. Forty-seven studies were finally included in this meta-analysis. The overall GC risk reduction benefit associated with anti-inflammatory drug use represented an RR of 0.78 (95% CI 0.71 to 0.85) and an adjusted RR of 0.74 (95% CI 0.71 to 0.77). Besides, the prevention benefit of aspirin/NSAIDs ingestion appeared to be confined to those patients with regiment of short or middle-term (≤5 years), high-frequency (>30 times per month) and low dose (<200 mg per day). Further, our data also suggest that COX-2 inhibitors use is a more effective approach in GC prevention (RR, 0.45; 95% CI, 0.29-0.70). In this meta-analysis, our finding support short or middle-term (≤5 years), high-frequency (>30 times per month) and low dose (<200 mg per day) aspirin/NSAIDs intake is a well method for GC prevention and also confirm the inverse association between aspirin/NSAIDs use and GC risk. Additionally, selective COX-2 inhibitors use probably a more effective approach to reduce GC risk. Keywords: anti-inflammatory drug, gastric cancer, risk factor, prevention, meta-analysis. Globally, there were 951,600 new gastric cancer (GC) cases and accounted for 723,100 deaths in 2012. GC is a major public health burden internationally, especially in parts of the developing countries (677,100 new cases in 2012). Recently, some therapeutic advances its prognosis is often unfavourable, and despite the decrease in overall incidence. Thus, effective and inexpensive strategies for prevention of GC are urgently needed in the developing world. Non-steroidal anti-inflammatory drug (NSAID) are a structurally diverse group of drugs that are most widely used to treat pain, inflammation and fever over the past decades, fundamentally including aspirin, celecoxib, acetaminophen, and other NSAIDs. These drugs are inhibitors of the enzyme cyclooxygenase (COX) and thereby affect the production of prostaglandin signalling molecules (PGs). Two isoforms of COX are well-known: COX-1 for the production of PGs during basal conditions in the gastrointestinal tract and an inducible COX-2 regulated by growth factors, mitogens, and tumor promoters . Until recently, compelling data from a large and rapidly expanding body of studies indicate that aspirin and other NSAIDs is associated with a decreased risk of colorectal, lung, and other carcinomas [4-6]. Nevertheless, the exact mechanism of risk reduction is still undetermined but may be related to these agents have decreased the level of prostaglandin E2 (PGE2). It is reported that PGE2 may modulate various immune responses, increase cells' longevity via inhibition of apoptosis, and stimulate cancer cell proliferation [7-9]. Since 1970s, a host of prior large epidemiologic studies and meta-analyses strongly support a protective association between aspirin/NSAIDs ingestion and gastric adenocarcinomas [10-18]. However, several studies argue that using aspirin or other NSAIDs does not lower risk of GC [19-21]. More recently, many novel studies have payed close attention to this topic [22-29]. Therefore, it is necessary to conduct an update meta-analysis for aspirin/NSAIDs use and GC. In addition, it is still unclear that the optimal regiment for GC prevention. In the present study, we performed an update systematic review of existing studies to explore the association between aspirin/NSAID intake and GC risk and a better benefit regiment for GC risk reduction. We aimed to conduct a systematic review (according to PRISMA statement) identify association between anti-inflammatory drug exposure and risk of gastric cancer. A literature search was performed in the databases of Medline (PubMed), Web of Science, Embase, OVID, Cochrane Library and Clincialtrials.gov before August 31, 2015 for related publications, using the following key words: (“aspirin” or “NSAIDs” or “non-steroidal” or “anti-inflammatory” or “cyclooxygenase inhibitors” or “COX”) combined with (“gastric cancer” or “stomach cancer” or “gastric adenocarcinoma” or “stomach adenocarcinoma” ) (for detail search terms see Supplementary Table S1).The retrieved articles were strictly examined to exclude duplicates or overlapping studies. In addition, reference lists of all retrieved articles and previous Meta-analyses were also checked for further eligible publications. Eligibility of articles were assessed independently by two reviewers (P. F. Kong and J. J. Liu). 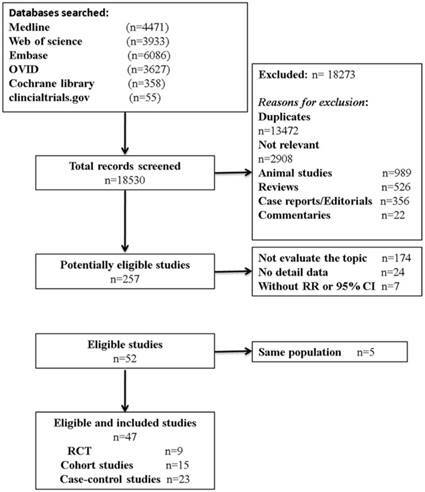 Our inclusion criteria for article were as follows: (1) exposure to any type of anti-inflammatory drugs; (2) measured the occurrence of gastric cancer; (3) randomized clinical trials (RCTs), cohort studies, or case-control studies; and (4) the odds ratios (OR) or relative risks (RR) and corresponding 95 % confidence intervals (CIs) were provided directly or calculated indirectly. In addition, reference lists of all retrieved articles and previous systematic reviews were checked for further qualified publications. For the multiple articles from the same population or data sets, only the most detailed or recent information were extracted. If necessary, authors were contacted for the detail or additional unpublished data. Animal studies, review articles, case reports, editorials, commentaries, and duplicate studies were excluded. The entire process of study selection is summarized in Figure 1. Two reviewers (P. F. Kong and R. Y. Wu) extracted the data independently and any disagreement was resolved by discussion. Briefly, the following information and potential confounders were extracted: first author, publication year, country, study design, population characteristics (i.e., number, age, and follow-up duration), medication type, frequency of use, information source for exposure measurement, and total number of persons or person years in each comparison group. Additionally, we evaluated the quality of the included studies using the Newcastle-Ottawa scale . Our meta-analysis was conducted to assess the efficacy of pre-diagnosis aspirin usage on incidence of GC. For observational study, we used the PRISMA guidelines for meta-analysis on data extraction, analysis, and reporting. Heterogeneity between individual studies was quantified by χ2 test and I2 test, respectively. p<0.05 and/or I2>50% suggests significant heterogeneity . Summary RRs (HRs) and 95% CI were calculated using a random-effects model for I2>50%, and a fixed-effects model was applied when the heterogeneity was not significant. The Galbraith plots was used to visualize the impact of individual studies on the overall homogeneity test statistic . Subgroup analyses were further conducted according to study designs (case-control, cohort or RCT), sample sources (population-based or hospital-based), geographical region (North America, Europe, and Asia), sites of cancer (cardia or non-cardia), exposure type (aspirin, celecoxib, acetaminophen, COX-2 inhibitors, and other NSAIDs), use at reference date (former and current), study quality (high and low), publication year (≤2000 and >2000), sample size (≤1000 and >1000), frequency, duration, dose effects (<200mg, 200 to 750 mg, >750mg), and adjustments for covariates, so as to investigate the deprive of heterogeneity. Sensitivity and subgroup analyses were used to dissect the heterogeneity. As described previously, to evaluate the publication bias risk, funnel plots were evaluated. Two-sided p values were calculated, with a p value <0.05 considered significant for all tests. All analyses were performed using the Stata software (V.19.0; Stata Corp, College Station, Texas, USA) . Flow diagram of study identification, screening, eligibility and inclusion. Our search strategy identified 18530 articles for eligibility, of which 257 were potentially relevant upon initial inspection of study topics. Forty-seven studies, comprising 2,345,540 patients and over 13,500 events reported the association between anti-inflammatory drug use and the risk of GC, met all of the selection criteria and were included in our meta-analysis (Figure 1) [10-15, 19, 21-29, 33-63]. Of these enrolled articles, nine were RCT studies [12, 23, 27, 29, 38, 44, 48, 52, 61], fifteen were cohort studies [15, 24, 26, 28, 33-37, 45, 46, 58-60, 62], and the remaining twenty-three were case-control studies [10, 11, 13, 14, 21, 22, 24, 25, 39-43, 47, 49-51, 53, 54, 56, 57, 63]. In our study, there were conducted, respectively, seventeen in North America [13-15, 21, 28, 35-37, 39, 43, 44, 47, 48, 53, 54, 57, 58], seventeen in Europe [11, 12, 27, 33, 34, 38, 40-42, 45, 46, 49, 50, 59, 60, 62, 63], eleven in Asia [22-26, 29, 51, 52, 61], and two in Australia [10, 56]. Additionally, the detail characteristics of the included studies are presented in Table 1 and Supplementary Table S2. As shown in Supplementary Table S3 and Supplementary Table S4, the methodological quality scores of 38 included observational studies ranged from 6 to 9, with an average of 7.95. The average scores were 7.96 for case-control studies and 7.93 for cohort studies, respectively. In addition, RCTs quality scores were also evaluated in Supplementary Table S5. Altogether, we demonstrated mostly enrolled studies with a high quality in our study. A pooled analysis was conducted on all 47 studies. The multivariable-adjusted RRs for each study and the combined RR for anti-inflammatory drug intake and the risk of GC are presented in Figure 2. Among all studies, 42 showed an inverse association between the anti-inflammatory drug and GC risk, 14 of which were statistically significant. Overall, the pooled analysis represented a summary RR of 0.78 (95% CI 0.71 to 0.85) with significant heterogeneity (I2=78.7%, p<0.0001). Abbreviations: HCC: hospital-based case-control, PCC: population-based case-control, RCT: Randomized, Placebo-Controlled Trial. * The expected number of events. In addition, the RRs were 0.84 (95% CI 0.65 to 1.10) for RCT studies, 0.81 (95% CI 0.67-0.98) for cohort studies, and 0.84 (95% CI 0.70 to 1.00) for case-control studies, respectively. In the six studies focus on GC-specific risk, there were in a relative low quality when using the Newcastle-Ottawa scale system to evaluate. [25, 29, 48, 51, 59, 61] After excluding the study with relative low quality, the heterogeneity extremely decreased across all studies (I2=39.0%, p=0.007) and the adjusted RRs were 0.74 (95% CI 0.71 to 0.77) (Figure 2). Accordingly, anti-inflammatory drug intake can significantly reduce the risk of GC. As shown in Table 2, the frequency of aspirin, COX-2 inhibitors and other NSAIDs use was divided into 4, 2, and 3 subgroups, respectively. We found an apparent trend with increasing frequency of drug use and GC risk reduction. On the one hand, in aspirin group, RR= 0.91 95% CI 0.77-1.08, for 1 to 15 times/month users; RR = 0.79, 95% CI 0.64-0.98, for 16 to 29 times/month users; RR = 0.74, 95% CI 0.59-0.92, for >30 times/month users. On the other hand, in other NSAIDs group, RR= 0.97 95% CI 0.77-1.21, for 1 to 15 times/month users; RR = 0.98, 95% CI 0.79-1.23, for 16 to 29 times/month users; RR = 0.72, 95% CI 0.59-0.88, for >30 times/month users. In addition, we also divided the duration time of different anti-inflammatory drugs into 4 (aspirin subgroup: ≤1 years, 2 to 5 years, 6 to 9 years, and >10 years), 2 (COX-2 subgroup: ≤1 years and 2 to 5 years), and 3 (other NSAIDs subgroup: ≤1 years, 2 to 5 years, and 6 to 9 years), respectively. Notably, we observed an unexpected trend of decreasing risk of GC associated with decreasing duration of anti-inflammatory drugs use. For instance, in aspirin group, RR= 0.69 95% CI 0.48-0.99, for ≤1 years users; RR = 0.74, 95% CI 0.63-0.87, for 2 to 5 years' users; RR = 0.81, 95% CI 0.59-1.13, for 6 to 9 years' users; RR = 0.86, 95% CI 0.48-1.55, for >10 years users. 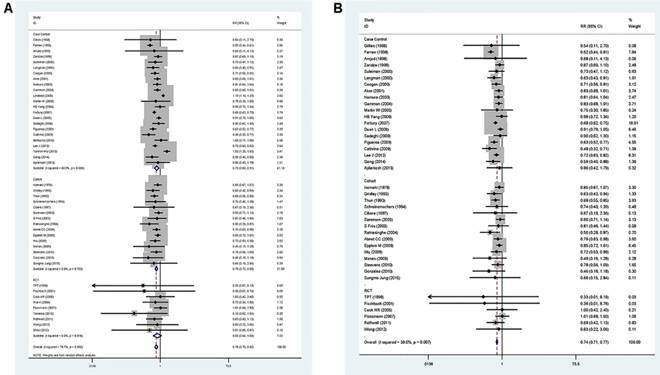 Furthermore, in COX-2 inhibitors users, compare with daily intake subgroup (RR = 0.48, 95% CI 0.30-0.78), the summary RR for twice daily intake subgroup (RR = 0.30, 95% CI 0.09-1.07) was lower. In our study, a linear positive correlation trend was found between duration of aspirin use and GC risk, though the result was not statistically significant (P for linear trend = 0.210; Supplementary Figure S1). As a consequence, we unravel a tendency towards stronger risk reduction for more frequent and short term aspirin usage. Forest plot of anti-inflammatory drug intake and risk of gastric cancer (ever use vs, nonuse). (A) Overall and (B) adjust for study quality. The pooled relative risk was achieved using random-effects model (I2>50%) and fix-effects model (I2≤50%). Grey square represents relative risk in each study, with square size reflecting the study-specific weight and the 95% CI represented by horizontal bars. Squares or diamonds to the left of the solid vertical line indicate benefit with anti-inflammatory drug intake. Frequency and duration on anti-inflammatory drug intake and gastric cancer risk. Abbreviations: RR, relative risk, COX-2: cyclooxygenase-2, NSAIDs: nonsteroidal anti-inflammatory drugs. Forest plot of different dose aspirin intake and risk of gastric cancer. The pooled relative risk was achieved using fix-effects model. Grey square represents relative risk in each study, with square size reflecting the study-specific weight and the 95% CI represented by horizontal bars. Squares or diamonds to the left of the solid vertical line indicate benefit with aspirin intake. Twelve studies that reported the RR and its 95% CI for the exact dose were included in our dose-response meta-analysis, six for aspirin [19, 21, 38, 52, 53, 62], five for COX-2 inhibitors [25, 27, 50, 51, 59], and one for other NSAIDs . The summary RR for < 200 mg/day of aspirin was 0.63 (95% CI, 0.49-0.81) with a heterogeneity (P =0.141, I 2=42.1%). However, for users of more than 200 mg/day, there were no monotonically decreasing trend, and on the contrary, a monotonically increasing trend was observed (RR =0.76, 95% CI 0.59-0.98, for 200 to 750 mg/day; RR = 0.94, 95%CI 0.58-1.54, for >750 mg/day). Additionally, the summary RR for 200 mg/day of COX-2 inhibitors was 0.50 (95% CI, 0.30-0.84) without heterogeneity (P =0.989, I 2= 0.0%). The rest results present in Supplementary Table S6 and Figure 3. Subgroup analysis by study design was conducted. Significant inverse associations were observed in cohort studies (RR, 0.81; 95% CI, 0.67-0.98) and case-control studies (RR, 0.84; 95% CI, 0.70-1.00). In addition, pooled analysis of RCTs showed a borderline significant decrease in GC to be associated with anti-inflammatory drug intake (RR, 0.84 95% CI, 0.65-1.10). (Table 3). Studies were stratified by geographic area, The RRs were 0.71 (95% CI, 0.64-0.79) for studies conducted in North America, 0.83 (95% CI, 0.72-0.96) for studies in Europe. These results indicate a significant inverse association between anti-inflammatory intake and GC risk (Supplementary Table S7). The possible association between the use of NSAIDs and site of GC was reported by twenty-three studies, thirteen in cardia [11-15, 26, 40, 41, 52, 54-57], and ten in non-cardia [11-15, 40, 52, 55-57]. In this subgroup analysis, cardia and non-cardia group both were existed heterogeneity, and all of the pooled analyses yielded statistically significant RRs. The protective effect of NSAIDs for non-cardia GC, with a pooled RR of 0.63 (95% CI: 0.54-0.73), was greater than that for cardia GC, with a summary RR of 0.80 (95% CI: 0.73-0.87) (Supplementary Table S7). Among subgroup analyses stratified by anti-inflammatory drug types, studies on aspirin (RR, 0.80; 95% CI, 0.73-0.87)[10-15, 19, 21, 23, 24, 35, 36, 38, 40, 47-49, 52-57, 61-63], studies on celecoxib (RR, 0.49; 95% CI, 0.30-0.81)[25, 27, 50], studies on acetaminophen (RR, 0.95; 95% CI, 0.83-1.10)[13, 54], studies on COX-2 inhibitors (RR, 0.45; 95% CI, 0.29-0.70)[25, 27, 50, 51, 59], and studies on other NSAIDs (RR, 0.81; 95% CI, 0.75-0.89)[12-15, 22, 26, 28, 29, 33, 34, 37, 39-46, 48, 49, 52, 54-58, 60]. Except the acetaminophen group, all of other groups showed statistically significant RRs, the outcomes indicated anti-inflammatory drug intake can reduce the risk of GC (Table 3). Sensitivity analyses were performed to explore possible causes of heterogeneity and the effect of various exclusion criteria on the overall result were examined. Twenty-two studies that were not adjusted for smoking, alcohol consumption, and BMI (body mass index) were omitted [10, 11, 19, 22, 28, 33, 34, 37, 39, 41, 44-46, 49, 52, 53, 56, 58-60, 62, 63]. The remaining studies produced an RR of 0.74 (95% CI, 0.70-0.79), with substantial evidence of decreasing heterogeneity (P=0.043, I2= 37%). Restricting analysis to the eight studies that were adjusted for race produced similar results (RR: 0.74, 95% CI: 0.66-0.84) [12, 13, 35, 38, 39, 43, 52, 55], but heterogeneity was still detectable (P=0.014, I2= 60.1%). Further exclusion of any single study did not change the overall outcomes, which ranged from 0.78 (95% CI: 0.71-0.86) to 0.79 (95% CI: 0.72-0.87). Meta-regression analysis demonstrated that geographic area (P=0.10), study quality (P<0.001), and publication year of study (P=0.09) were significant sources of heterogeneity, but the outcomes indicate that study design, drug type, and study size were not the main origin of heterogeneity. Geographic area alone explained 10.12% of the τ2 in the meta-regression analyses, study quality explained 61.75% of the τ2 and publication year explained 5.44% (Supplementary Table S8). The funnel plot did not show any notable asymmetry (Supplementary Figure S2). No publication bias was detected using the Begg's test (P = 0.551) and Egger's test (P = 0.070). Subgroup analyses of anti-inflammatory drug intake and gastric cancer risk. Abbreviations: RR, relative risk, RCT: Randomized, Placebo-Controlled Trial, HCC: hospital-based case-control, PCC: population-based case-control, COX-2: cyclooxygenase-2, NSAIDs: nonsteroidal anti-inflammatory drugs. In this meta-analysis, data were available for more than 2.3 million individuals and more than 13,000 GC events. Our study has found several unexpected findings with important clinical implications. First, this work provides first convincing evidence that probably short or middle-term (≤5 years), high-frequency (>30 times per month) and low dose (<200 mg per day) anti-inflammatory drug use is associated with a statistically significant reduction in the risk of GC. For most of the 20th century, anti-inflammatory drug commonly is a mainstay of the treatment of inflammatory and of acute pain such as stomach pain . Currently, many studies identified that aspirin and other NSAIDs have played important roles in cancer prevention [65-67]. However, until recently, there has been no reliable data to unravel the exact dose and treatment regimen for optimal benefit for cancer prevention, especially in GC. In the present study, we unequivocally showed that short or middle-term (≤5 years), high-frequency (>30 times per month) and low dose (<200 mg per day) anti-inflammatory drug intake could be a better regimen, which was related to significantly decreased risk of GC. Commonly, it is difficult to evaluate with precision the consumption of NSAIDs. One clinical trial has shown that a daily intake of aspirin about 6.8 years (75mg) present some obvious reductions in the incidence of GC . Another study indicates that less than one year and one or more tablets per day were also effective . There was, however, one study argues that daily intake of aspirin about 5 years (500mg) that did not offer any protection . In one previous meta-analysis, Ye et al concluded that long-term (>4 years) and low-frequency (1 to 4.5 times per week) aspirin use is associated with a significant reduction in the incidence of GC . Surprisingly, in our study, we observed an unexpected trend of decreasing risk of GC associated with decreasing duration of anti-inflammatory drugs use in aspirin and COX-2 inhibitor subgroups and the short or middle term treatment (≤5 years) had significance GC risk reduction (Table 3). 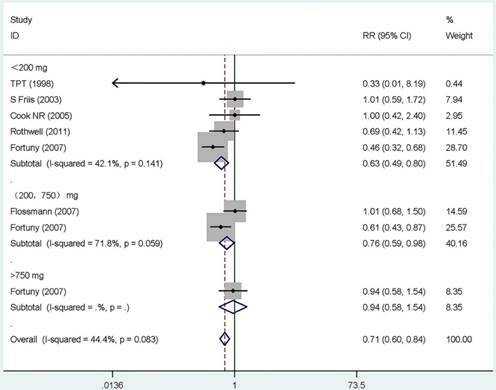 Further, as shown in Supplementary Figure S1, years of aspirin intake was positively associated with RR in a linear regression model, but the outcome without statistically significance (F=1.69, P=0.210). We have to point out that only three studies were included in the old regression model , which is short for statistic power. However, all available data (twenty-one studies) were enrolled in our novel model. Thus, our results more reliable than the old one. In addition, another interesting finding was that high-frequency (>30 times per month) and low dose (<200 mg per day) anti-inflammatory drug intake likely an optimal benefit regiment for GC prevention. Similarly, it is commonly reported in many colorectal cancer studies . A potential explain for this phenomenon might be relative low dose NSAIDs exposure avoid of many side effects such as peptic ulcers [69, 70]. that short-term (≤1 years) daily COX-2 inhibitors intake is likely a better treatment than others for GC prevention. It has been reported that both mRNA expression and levels of COX-2 protein are elevated in GC tissue . In last ten years, many animal and clinical studies have disclosed the chemopreventive effect of COX-2 inhibitors; and in particular, a few studies have strongly stated that COX-2 inhibitor prevents the development of GC . In addition, another reason for COX-2 inhibitor intake in GC prevention is that COX-2 inhibitor has less side effects than the other NSAIDs. For instance, in COX-2 inhibitor user, the most serious adverse reaction is related to increase risk of serious cardiovascular harm . Interestingly, it is reported that cardiovascular events elevated only when the dose over 400 mg per day . However, in our meta-analysis, the recommended of COX-2 inhibitor intake is low dose (<200 mg per day), which can avoid most of cardiovascular risk for the users. Additionally, selective COX-2 inhibitors can disturb renal physiology but the impacts are relatively weak and not clinically important. Accordingly, individuals are likely benefit a lot in COX-2 inhibitor intake for decrease GC risk and large-scale randomized clinical trial is further needed. Third, the largest synthesis so far to our knowledge in the present study highlight that intake of NSAIDs intensely reduce the risk of GC. The protective rate can reach 22% after excluding the publication biases and using the adjusted dataset, but with a large between-study heterogeneity (P<0.0001, I2= 78.7%). Indeed, after we kicked out six studies with relative low quality [25, 29, 38, 48, 51, 59, 61], the heterogeneity dramatically decline to 39.0% (P=0.007, I2= 39.0%) and the reduction of GC risk still significant (RR, 0.74; 95% CI, 0.71-0.77.). Hence, the main source of heterogeneity may in view of the fact that the relative low quality studies enrolled in the meta-analysis. Previously, several meta-analyses have found aspirin or NSAIDs use inversely associated with GC risk [16-18, 20], but we still have a problem that all those studies were short of statistic power and recently data. For example, the largest scale study were generally enrolled twenty-one qualified studies range from1968 to 2003 and the summary RR was also with a high heterogeneity (I2= 59.8%). In our study, we searched a multitude of online dataset and eventually forty-seven studies were included in our analysis, among of which nineteen new studies were never covered in the previous meta-analyses [19, 22-29, 38, 39, 44, 49-51, 53, 56, 58-60]. Nevertheless, since the deficiency of randomized clinical trials, the strength of this study was impaired for drawbacks associated with an army of observational investigations. In conclusion, unlike early studies, this meta-analysis is a more comprehensive and better designed study which conducted in both RCTs and observational studies and deeply discuss the most optimal regiment of anti-inflammatory drug exposure for GC risk reduction. It demonstrates clearly that short or middle-term (≤5 years), high-frequency (>30 times per month) and low dose (<200 mg per day) anti-inflammatory drug use is associated with a statistically significant reduction in the risk of GC. In addition, our data also strongly suggest that COX-2 inhibitors use is a more effective approach to reduce GC risk. However, because of potential bias and confounding factors, these results should be treated with caution. As a consequence, more and better-designed high relevant large clinical trials is an urgent need in the future. This study was supported by grants from Natural Science Foundation of Guangdong, China (No. 2015A030313010), Science and Technology Program of Guangzhou, China (No. 1563000305) and National Natural Science Foundation of China (No. 81272641and No. 81572409). The authors thank Dr. Yixin Zhou for statistical advising and review of the manuscript and Xuan Lee, and Min Ma for review of the manuscript. Conception and design: LPX, DZX, ZWZ, PFK. Development of methodology: PFK, RYW, XCL. Acquisition of data: PFK, RYW, XCL, JJL, ZS, CJ. Analysis and interpretation of data: PFK, RYW, XCL, SXC, MTY, CLY, QY, FXL. Administrative, technical, or material support: PFK, RYW, XCL, JJL, SXC. Study supervision: LPX, DZX, ZWZ, RJP. Corresponding author: Liangping Xia, MD, PhD, Department of the VIP region, Sun Yat-sen University Cancer Centre, Guangzhou, China, 651# East Dongfeng Road, Guangzhou 510000, Guangdong Province, PR China. Fax: (+86) 020-87343107. E-mail: xialporg.cn.